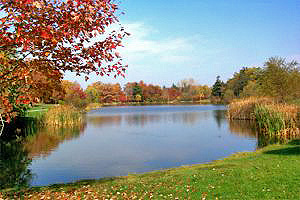 Designed by Frederick Law Olmsted, this unique 297 acre park offers many different aspects of nature, as well as offering recreational areas. Seneca Park provides three picnic shelters, the Wegman Lodge, playgrounds, scenic views of the Genesee River gorge, hiking trails, open fields and large pond with a paved walking path. For information and reservations please call 585 753-PARK (7275) or go to our Online Lodge & Shelter Reservation System. Seneca Park is located at 2222 St. Paul Street, Rochester, NY 14621, along the eastern bank of the Genesee River in the northern portion of Rochester. Enter the park from St. Paul Street, just north of Route 104. Fishing- Fishing is allowed in Seneca Park as long as those fishing are following NYS Department of Environmental Conservation guidelines and rules and have the required licenses. Originally called North Park, this three-mile preserve of forested river gorge was renamed Seneca (which means “stone”). Another of Frederick Law Olmsted’s works of living art, Seneca Park features Trout Lake which was created by damming a natural spring. Swan boats, propelled by drivers who pedaled the boats like bicycles, carried visitors around the lake until 1922. Seneca Park is open daily 7:00 a.m. until 11:00 p.m. during the summer. Seneca Park has a Carry In-Carry Out rule, which means you must take all your garbage with you for disposal after leaving the park. All pets must be leashed and you are responsible for cleaning up after them. Amplified music is prohibited in the lower park. Seneca Park has one bathroom facility that is available between May 1st and October 31st, and that is located next to the Longhouse Shelter. See the park map for specific locations. See the park map for specific locations.